You know what: for a flying animal, that’s not bad. I mean, it’s titchy compared to the sauropod and the whale, but the terrestrial mammals aren’t looking so confident. In fact, I reckon Matt’s being eyed-up as a Hatzegopteryx hors d’oeuvre. So, assuming he survived the ordeal without a trip through a pterosaurian alimentary canal, well done Matt. When I have the time, I’m going to draw life restorations of all these critters alongside each other. On industrial sized paper. Actually Mark, I was thinking just how impressively big it looked compared to the ‘pod. They really are massive and this actually shows it off pretty well. I’d like to see a comparison of their cervicals and those of something like Mamenchisaurs – is there a possibility of further pterosaurs / sauropod crossovers? Sometimes, flagrantly playing to the audience is just the right thing to do. This is pretty astonishing. It’s arguably the single most beautiful image anywhere on the Internet, and ought to be much more widely known. If we’re going to have guest pterosaurs, shouldn’t there be some comparison of the pneumaticity of their vertebrae and those of sauropods, especially something about the extent to which there are similarities in how they are pneumatized. So, this is where we start betting what they add next? I’m guessing T. rex, Liopleurodon ferox or Dicrostonyx torquatus. Oooh, yeah, get one of the mega-theropods in there like Carcharodontosaurus or Gigantosaurus. I don’t think Leopleurodon is known from good enough remains to really comment on its size. The species we have in Alaska was only 20 feet long, for instance. I think Kronosaurus would be a better animal for this instance. We might as well declare azhdarchids honorary sauropods, and be done with it. Hmm, plesiosaurs too. And geese. Damn that Hatzegopteryx was big! I wonder if they ever buzzed sauropods. 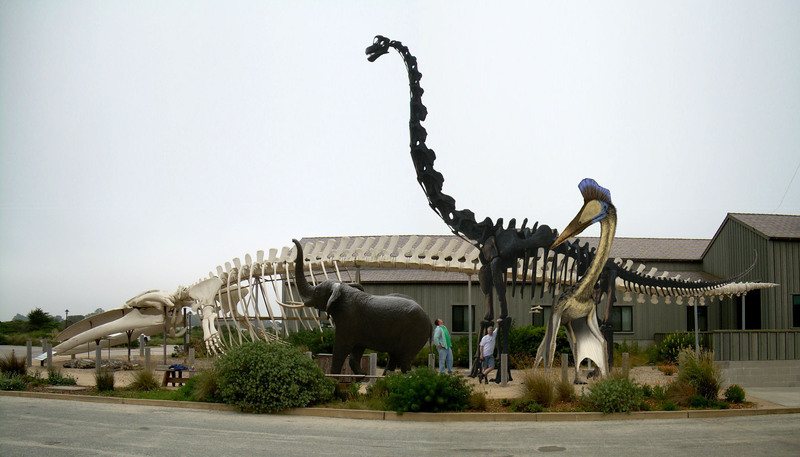 That blue whale skeleton is actually only a mile from my field area on the coast near Santa Cruz, CA. Last summer I took a photo of the skeleton, but finding a standard issue SVP scale bar or a quarter to be more or less inadequate, I instead used my 1984 Honda accord. How about a Tylosaurus to give the lepiodaurs some recognition. I admit that when I first put Zeggy in there I thought, “Oh.” I guess I had been expecting it to be bigger. Then my brain caught up with my gut and I remembered that unlike all the rest of the things in the picture, Hatzegopteryx flew under its own power. And it could look over the shoulder of Brachiosaurus. And I could walk between its hind legs without bumping my head on its arse. I’d like to put in a giraffe. Not because it will look big, but because it’s smallness will finally be revealed. A world-record giraffe could just get its head over the shoulder of Brachiosaurus, something that Hatzegopteryx could do without breaking a sweat. Anything that makes a giraffe look ho-hum is cooler by comparison. I’d also like to put in T. rex or another one of the big theropods. T. rex is about 4 meters at the hip, which is big but not that big, not in this bunch. What I wouldn’t give to see a pterosaur that size trying to get airborne in time to escape a charging tyrannosaur. Let’s get Attenborough out of retirement and get him a time machine, stat! I like this picture very much. I think I was born to see it. Or some such. A trained harnessed Hatzegopteryx would be a backpacker’s dream. Fly on it wherever you like ‘cross any terrain, then camp out under it… Transport and domicile combined, neat! Great collage! well done. Anyway I think that Matt is too tall in this scale, making blue whale too big. Taking by refence Mike, we can say that to the top of the Brachiosarus ulna there are more than 2 meters. Around 2.1 (7 feet) or more. Matt, in this collage you are more than 2.2 meters high! I think that brachiosaurus must be larger. In another vein, I want to know if that brachiosaurus skeleton mount is well done, because the new giraffatitan mount has the shoulder blades much more vertical (making taller the shoulder height) than brachiosaurus altithorax skeleton. I’m curious to what the largest T-Rex specimen discovered so far is, I know Sue is largest and most complete but I hear something about C-Rex or another specimen. What are their dimensions? Anyway I think that Matt is too tall in this scale, making blue whale too big. Taking by refence Mike, we can say that to the top of the Brachiosarus ulna there are more than 2 meters. Around 2.1 (7 feet) or more. No, I’m not. My feet are somewhat obscured by the bush in front of me, but if you look closely you can see that I’m supposed to be standing back by the far forelimb of the Brachiosaurus, whereas Mike is standing by the near forelimb. Because of perspective, the two forefeet are not at the same vertical level in the picture. I’m not 2.2 meters tall in the picture because my feet are not at the same level as Mike’s. It is possible that I should have found another way to show the perspective, but I know for certain that I’m not too big in this picture because I am one of the original, un-composited parts. All I changed from the original was to flip myself horizontally and scoot myself over to make room for the elephant. If you go through the links on this post and its predecessor, you’ll find my explanations of how big the originals are and how I scaled them. If I’ve made a mistake, I’d be grateful for an explanation. What, you mean the brachiosaurus wasn’t in the original photo? What could have been the point of the exhibit, then? It would only have (stinkin’) mammals. What was the longest/biggest/heaviest marine reptile? Comparable to cetaceans? Closest to what size whale? I think Brachiosaurus is Bigger than that.